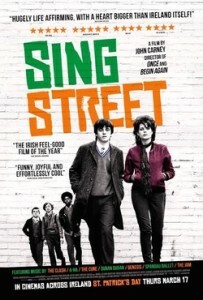 A light-hearted and cute movie about a high school student who starts a band just to get the girl. This is a very clever and entertaining movie. It’s not a romantic comedy per say, but at times it feels like one. The movie straddles the lines between genres, including black comedy and romantic drama. It’s the story of a kid who creates a band and starts writing songs and making music videos just to get a girl to be in them. The premise alone is pretty cool, and the movie takes these ideas and runs with them in lots of fun directions. 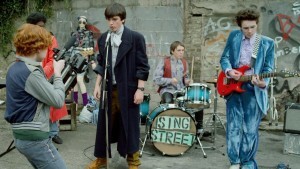 Sing Street is a cute and fun Irish movie about a high school kid, caught up in a lousy situation, who finds a way to make the most out of it. Connor is a kid from the wrong side of the tracks, with his large family that just doesn’t have the money to pay for his nice private school anymore. In the opening scene, his father tells him this, while surrounded by the rest of the family, and it gives us a nice introduction to all of the characters. The scene also helps us jump right into the plot, without wasting any time. In this opening scene, the two key characters that we meet, (other than Connor, of course) are his father and his older brother. The father is played by Aiden Gillen (The Wire,) best known these days as Little Finger on Game of Thrones. He’s really the only recognizable actor in the movie, and does a good job with a limited role, playing the head of the household. The brother, Brendan, is Connor’s role model, a guy who is equal parts openly honest and cool. Brendan loves the music of the time, (the 80s) and comments on the music videos of Duran Duran as he watches them. This inspires Connor a little bit later on in the movie. First he has to go to a new school, and deal with the bullies and harassment there. This harassment comes from both kids and adults. Connor has a particular problem with the schools headmaster, who insists that Connor must wear black shoes. Only Connors family can’t afford them, and so the headmaster makes Connor leave his shoes in the office and walk around in his socks all day. And then there’s the bully who tries to make Connor dance in the men’s room with his pants down. Connor Refuses. The kid lets him leave, and as an audience member, we wonder why. We get our answer shortly afterwards, when the bully gives Connor a beating in the courtyard, where all the other kids can see him getting punched in the face. This is Connor at his lowest point. The good news is that it leads to his meeting a boy who will help change Connor’s life. Right after the face punch, a boy named Darren approaches and tells Connor that he should have just danced for the bully. While Connor is talking to Darren he sees a beautiful girl standing on her doorstep, across the street. Connor walks over to the girl, named Rafina, and tells her he needs a model for a music video that his band is making. Of course, Connor doesn’t actually have a band. Now he goes back to Darren and says he needs to start a band immediately. Darren says he can help. He knows a kid who is crazy musically talented and can play multiple instruments. Darren will make the introduction and then become the bands manager. And just like that, the wheels are in motion to start up a new band. Darren introduces Connor to Eamon, the great musician. The Connor and Eamon start writing songs together. Their first song is called The Riddle of the Model, and that’s what they set out to shoot a music video for. The filming scene is great. Some of the kids wear hilarious outfits and costumes, and Rafina does Connor up in some extreme makeup. One boy wears a cowboy outfit complete with sheep skin leggings. Connor looks like he’s pure goth. And they go about filming these kids playing music, with Rafina walking around looking as mysterious as she can. The next video they film is on the beach, with Raphina jumping in the water even though she can’t swim. She does it because she’s going for full authenticity. Connor jumps in and saves her. Then they kiss, and everything seems great until he ruins the moment by asking about the guy she’s been seen driving around with. Connor and Rafina have their first date, taking the family boat out for a drive to an island. Rafina confides in Connor about her dream to leave Irelsnd for London and pursue modeling. Then we get into the second half of the movie, and it takes a note from the usual romance movie formula, to have the characters split apart and take some time off from each other. Only here, this actually feels authentic, as Connor and the group have no idea what happened to Rafina, and are pretty upset about it. This leads to two different climaxes, one about the music, the other about the romance. The movie works on most levels. It doesn’t feel completely fresh or original, because it’s a pretty familiar genre, but what the movie does with it is kind of creative. I guess I wish the movie spent a little more time on the band, and showing us the kids who learned how to play instruments and things like that. The movie has great side characters, like Brendan, but maybe not quite enough of them. Especially the father. Just one scene of him and Connor sitting down for a heart to heart would have been great. But I suppose the point is that Brendsn is more like a father figure than his actual fatter is. The movie does a nice job of hiding the conflict from us until the second half and then suddenly hitting us with it hard. This movie might sometimes feel familiar, but it’s still a lot of fun.